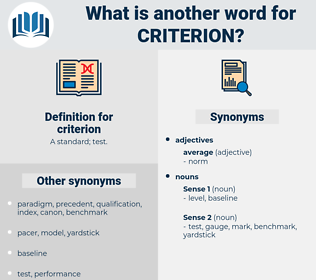 What is another word for criterion? 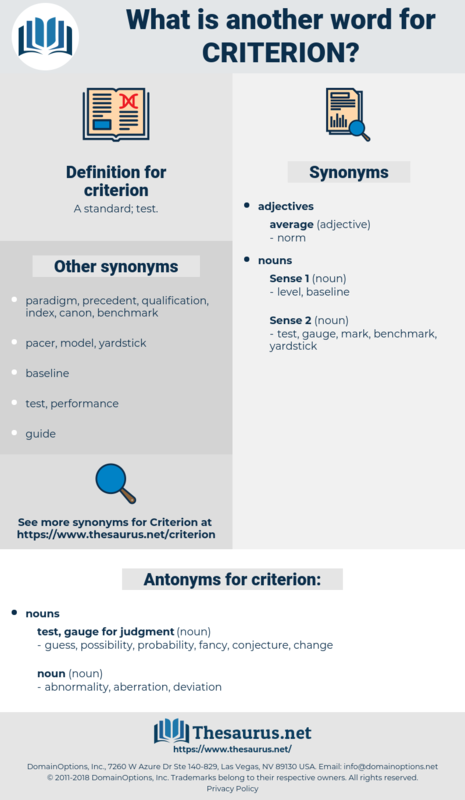 discretion, factor, touchstone, principle, principles, endpoint, measure, justification, determinant, determinants, consideration, prerequisite, indicator, notion, concept, parameter, argument, definition, element, desirability, denominator, reason, judgment. Guidelines, requirement, requirements, test, Tests. yardstick, precondition, condition, qualification, pre-condition, norm, threshold, guideline, Guidelines, requirement, judgement, test. guess, possibility, probability, fancy, conjecture, change. The 67 names are therefore no criterion for population. Neither national wealth nor population nor the strength of the national army and navy will serve as a criterion, though all perhaps would be factors in determining the shares of the different countries. ceratotherium, cordarone, courtroom, carry to term, cardroom, car train. control condition, control, design criteria. yardstick, monetary system, GPA, era, earned run average, medium of exchange, norm, gauge, scale of measurement, baseline, scale, ordered series, grade point average, procrustean rule, procrustean bed, standard of measurement, graduated table, benchmark, procrustean standard.